Posted on June 29, 2016 by Barry V.
I spend the night at the South Shore home of Julianne and David Mehegan. Gracious and generous hosts – thank you both for opening your home to me! Fortunately, the day starts out DRY, with a forecast promising no further rain until the afternoon. I say my good byes to David and Julianne and get an early start to North River Wildlife Sanctuary in Marshfield. This is a bustling sanctuary with a well-appointed visitor center. As I arrive, visitors are gathering for guided walks and the staff is preparing for the day ahead. I meet David Ludlow, who is full of advice and helpful tips on birds, wildflowers and other current points of interest on the sanctuary. I want to see the North River first, so head out on the River Loop. A field sparrow sounds off in the brush of the upper meadow as I cross Summer Street, and a bluebird chortles from the woods. A “colony” of purple martin gourds (actually plastic facsimiles that are easy to maintain) has been erected in the upper meadow, and I spot a dark bird perched on one of the supporting cables, but assume it’s probably a tree swallow. My binoculars tell otherwise – it’s a purple martin! I start to draw and within a half hour another martin arrives. They check out the gourds and sit on the cables, squabbling occasionally – these are two males. 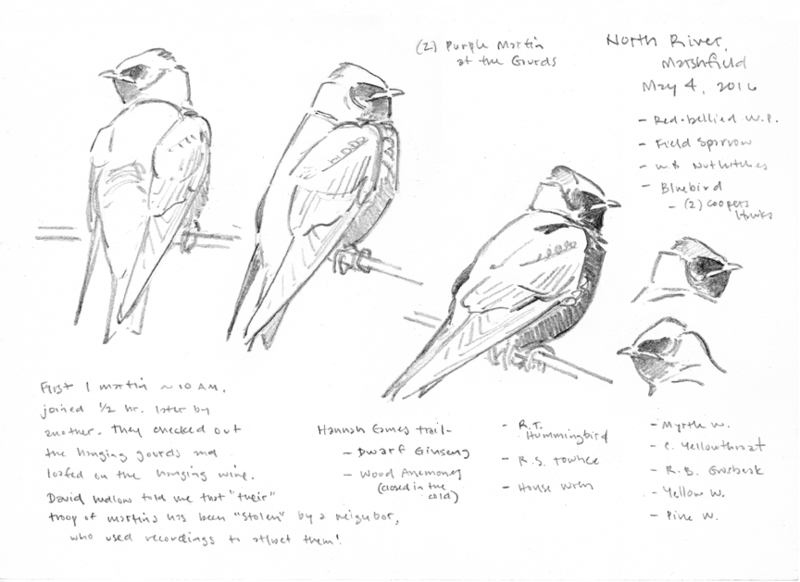 I learn later from David that some of the North River martins had moved to a neighbor’s set-up, who even used sound recordings to attract them. But, more recently, I’ve had news that the martin colony at North River is doing well, with four or five pairs nesting in the gourds. I DO hope there are enough martins to go around! This painting, which I produced later in the studio, plays on the stark contrast between the angular shapes of the birds and the regular, rounded shapes of the artificial gourds. 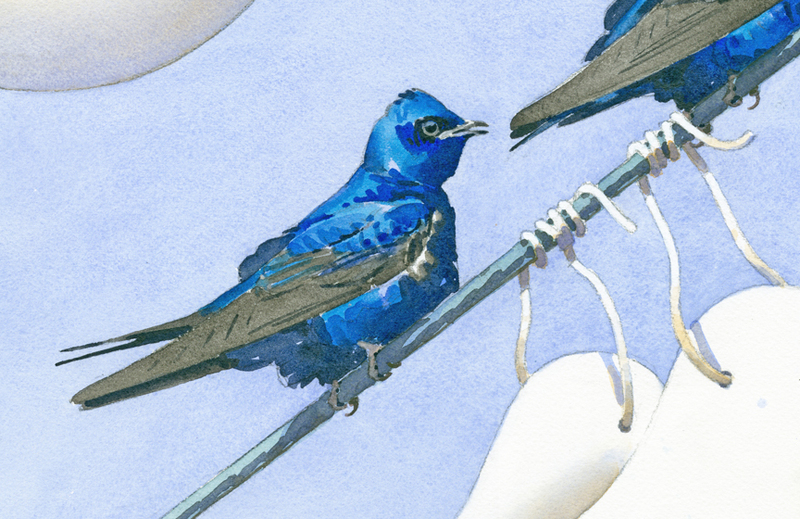 Very dark birds with shiny, iridescent plumage can be challenging to paint. In an instant, any part of the bird might go from bright blue to jet black as the angle of light striking the plumage changes. The glossy plumage makes for lots of abrupt shifts in value as various parts of the bird catch the light. I may have gotten the blue highlights abit bright here, but I didn’t want to lose any more of the modeling of the bird’s forms by making the highlights darker. 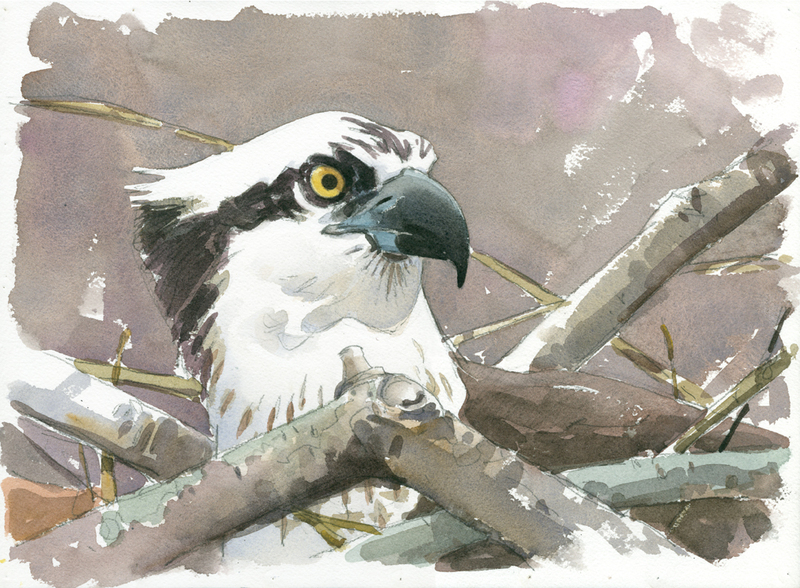 In the lower end of the meadow, closer to the river, a big platform has been erected to attract nesting ospreys, and sure enough, a bird sits on the nest, likely incubating eggs. The cloudy day brings out the subtle spring colors on the distant hills. 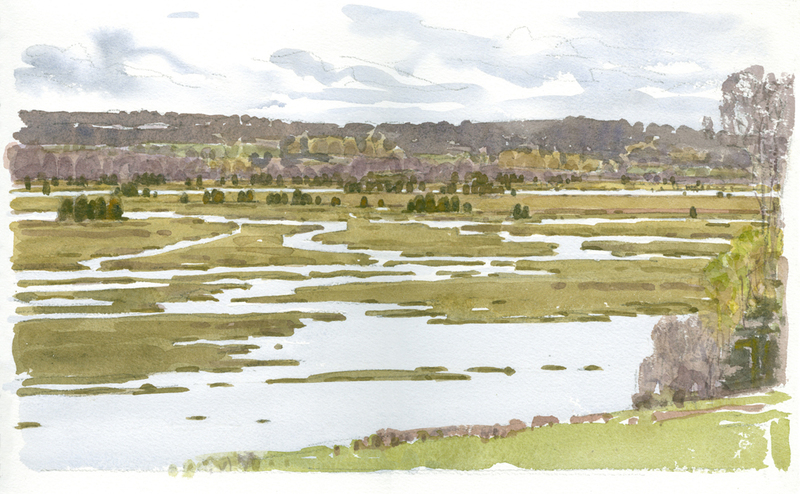 It’s currently high tide and the channels in the marsh make interesting patterns. Also appealing are the cedars on the upper marsh, which march across the scene in a series of dark accents. To finish the day, I explore the trails to the south of the visitor center. Ferns, still in the form of fiddleheads, are poking up everywhere along the Woodland Loop. A new trail on the Sanctuary leads to Hannah Eames Brook. 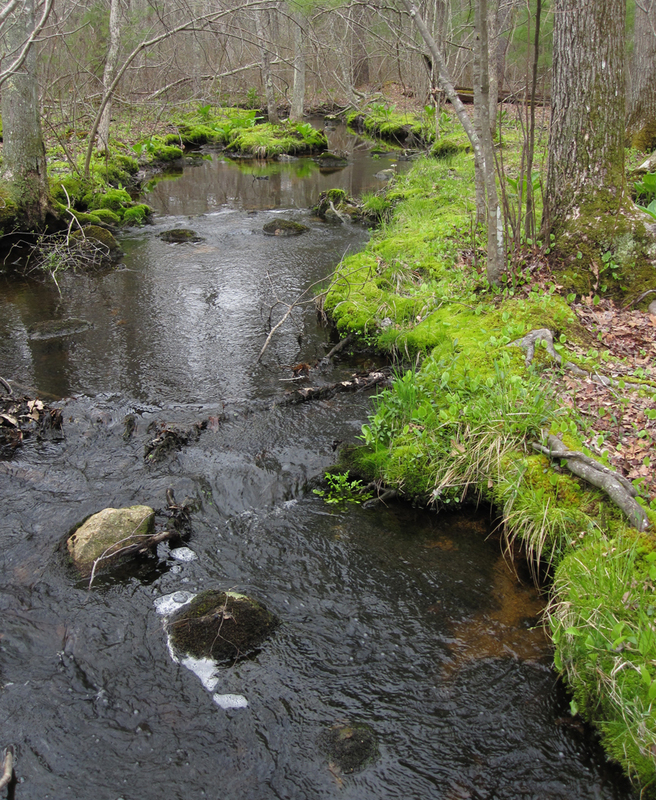 It’s a delightful, clearwater stream that tumbles between moss-covered banks spangled with wildflowers. 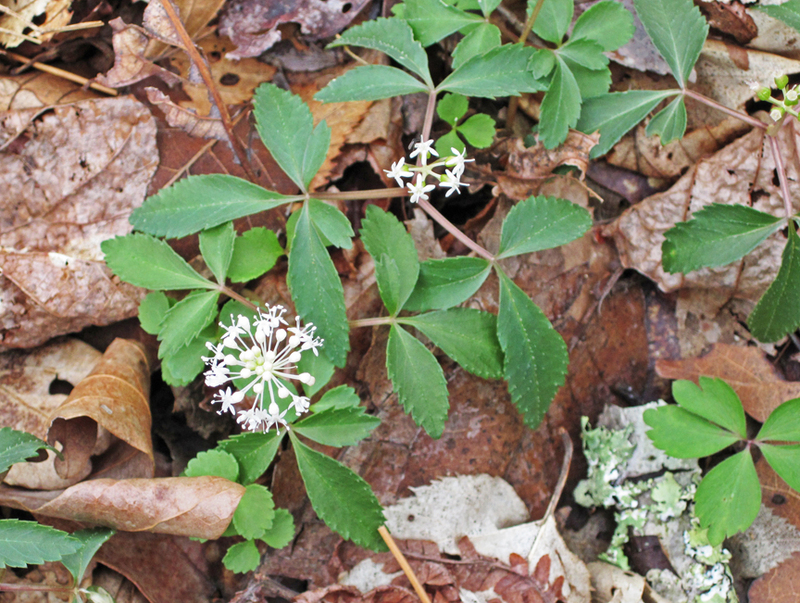 I pause to admire the delicate, lacy blossoms of dwarf ginseng. 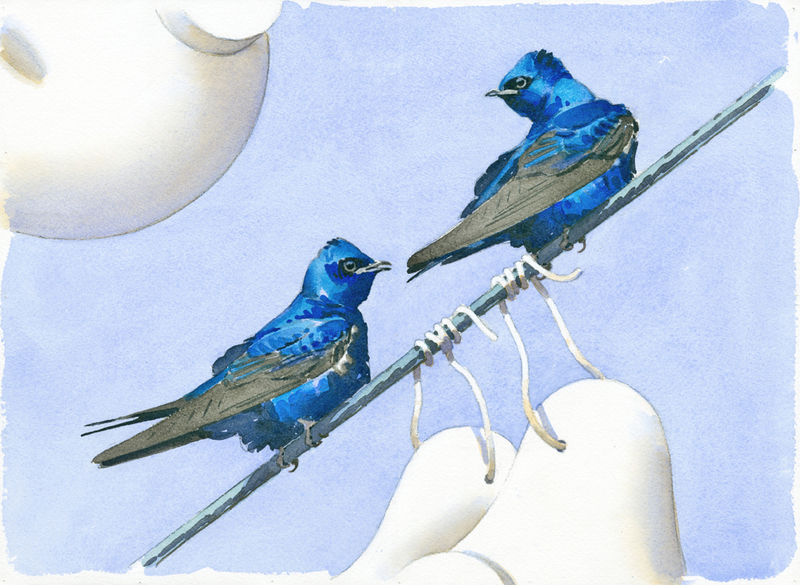 This entry was posted in Artists, Barry Van Dusen Residency, News and tagged David Ludlow, Dwarf ginseng, field sparrow, Landscape, Mass Audubon, North River, North River Wildlife Sanctuary, Osprey, Purple Martin, Purple martin colony, Purple martin gourds, Saltwater, Watercolor on June 29, 2016 by Barry V..
Posted on August 25, 2015 by Barry V.
Although the swamp azalea is past flowering, sweet pepperbush is just starting to come into bloom along the trails and boardwalks at Stony Brook Wildlife Sanctuary. Soon the air will be filled with its thick, sweet aroma! 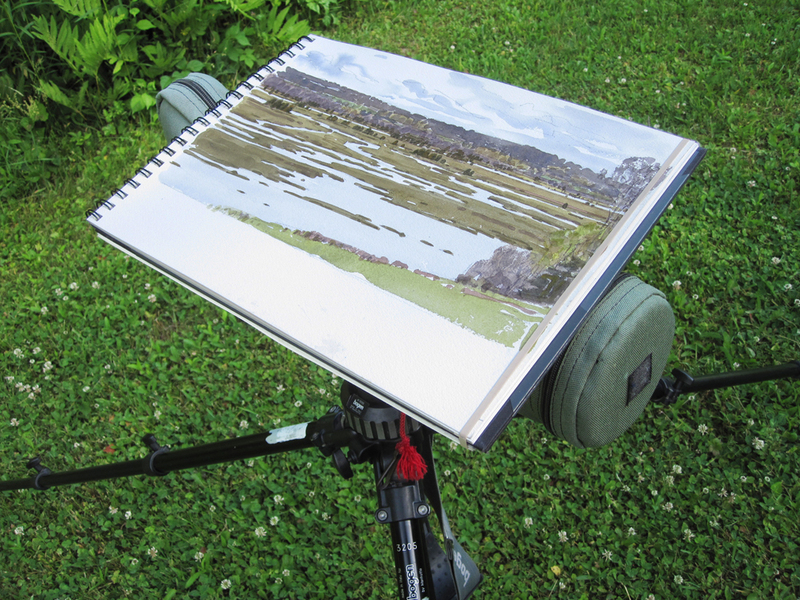 The boardwalks and viewing platforms afford excellent views of several ponds and marshes, with room enough to set-up my scope and do some drawing. Great for turtle watching! On a warm, sunny morning like this, the painted turtles are vying for basking space atop the stumps rising out of the lily pads and waterlilies. 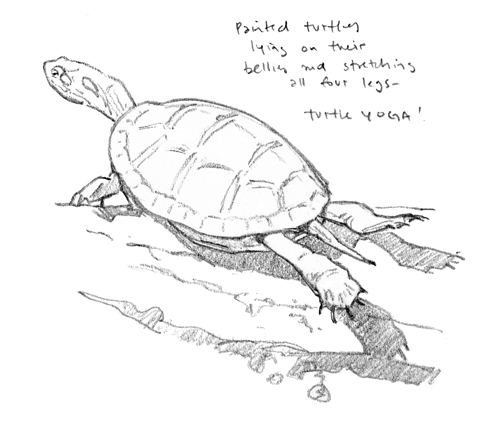 I’m intrigued by the way the turtles often pose with their legs stretched out straight, resting on their plastrons. Sometimes they tuck in the front legs, with only the rear legs extended, other times all four legs are stretched out at once. It’s very similar to a pose we do in my yoga class. Am I watching Turtle Yoga? I ask some naturalists about this later, and one conjectures that this behavior may expose soft parts around the turtles legs to the sun and air, thereby deterring leeches. Another theory is that extending the legs in this way exposes more of the skin to the sun, and enhances the basking effect. And there are other turtles, too. 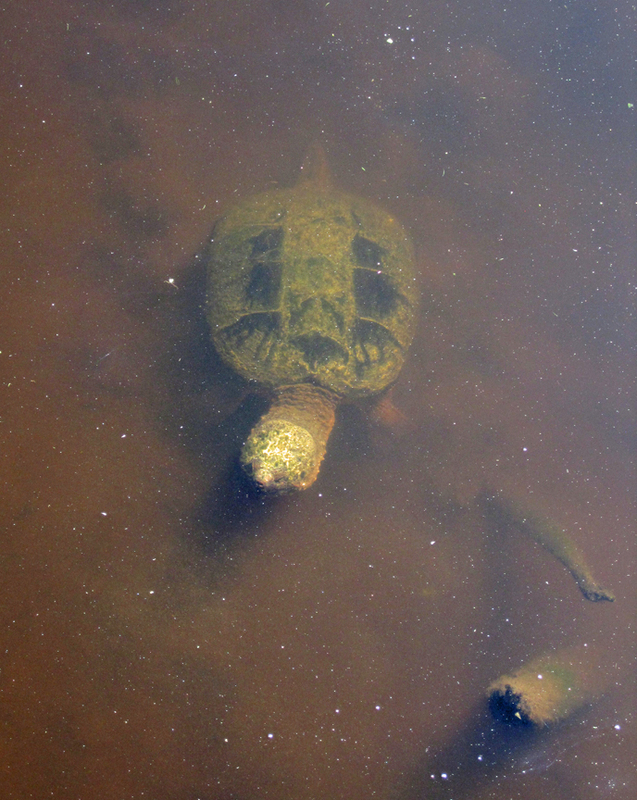 I watch the eerie slow-mo movements of a big snapping turtle from the observation platform at Teal Marsh. Heading back to the visitor center, I hear the distinctive notes of a purple martin. Upon my arrival at the sanctuary earlier, I had noticed the martin house in the big field next to the parking area, but seen only house sparrows perched there. Now, I focused my scope on the house and found a single martin perched on the top mast. Later, I asked sanctuary director Doug Williams about the birds and was pleased to hear that the martins were in their third year of using the box and that this year three nests had produced a total of 10 young birds! I saw no more martins this day, but was happy to know that the colony is on the increase! 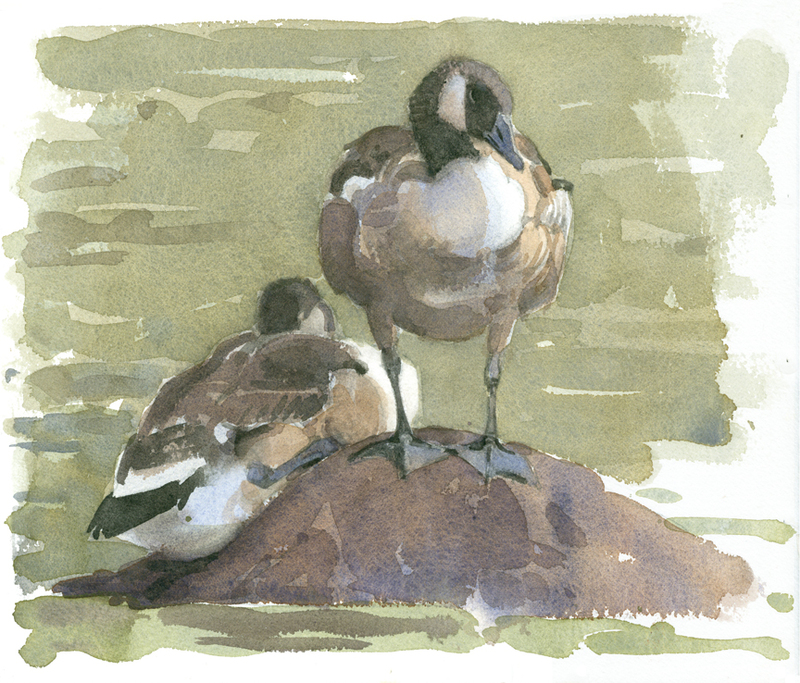 Heading out again to do the Pond Loop Trail, I notice a pair of young Canada geese loafing on a rock in Stony Brook Pond. They’re about 2/3 the size of their parents, who stand guard nearby. 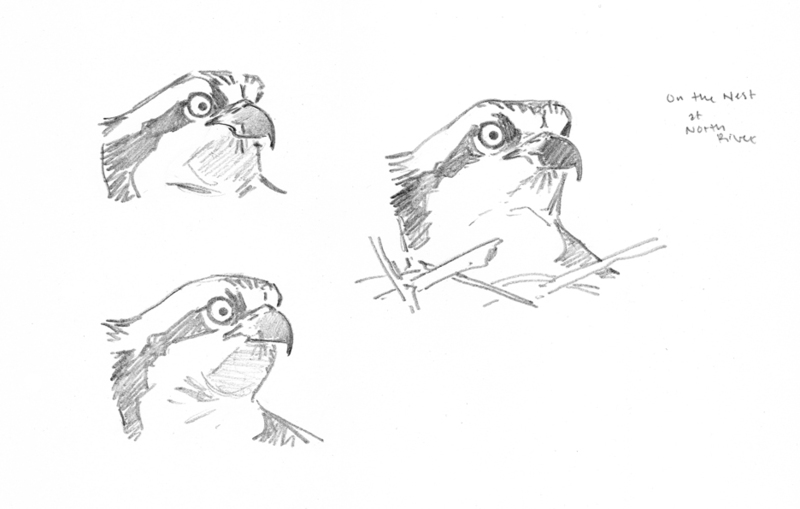 In a scruffy adolescent stage, they are still downy on the neck and head, and their colors are soft and muted compared with the adults. At the bridge between Kingfisher Pond and Stony Brook Pond, I notice several large dragonflies on the concrete bridge abutments. I’ve been watching dragonflies all day – many pondhawks and slaty skimmers, a few widow skimmers and some tiny amberwings – but this one I can’t identify. Occasionally one takes a handstand-like pose with its abdomen pointing straight up. Actually this is a common behavior among odonates called the obelisk posture (there’s that YOGA thing again! 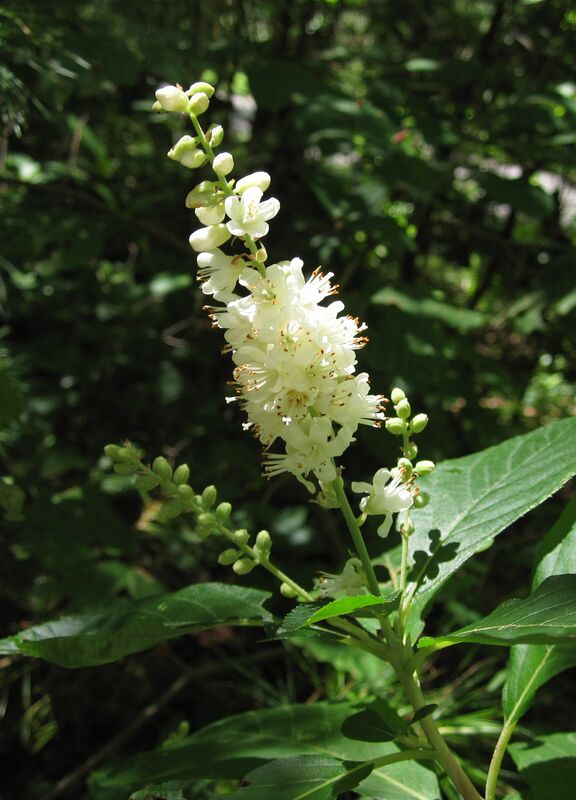 ), and it is thought to help with thermoregulation on warm days. As luck would have it Robert Buchsbaum arrived on the scene, toting a dragonfly net and, more importantly, a dragonfly field guide (he was helping some volunteers with an odonate survey). 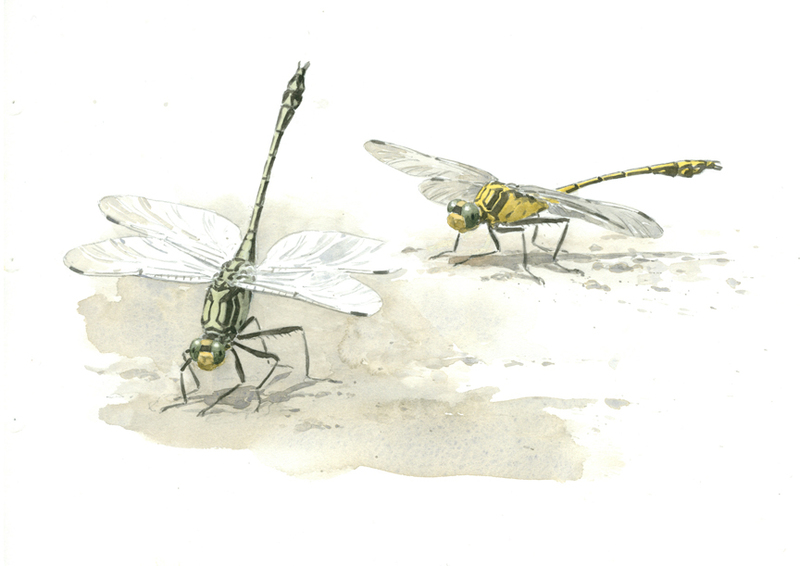 Between studying my drawings and digital photos, we tentatively identified this insect as a black-shouldered spinyleg. Later I was convinced of our I.D. by noting the spines on the rear legs in my digital photos and also by a phrase which I read in the Mass Audubon pocket laminated guide A Guide to NE Dragonflies and Damselflies – in the brief description of this species written by Chris Leahy, he concludes with “Often perches on bridge abutments.” BINGO! 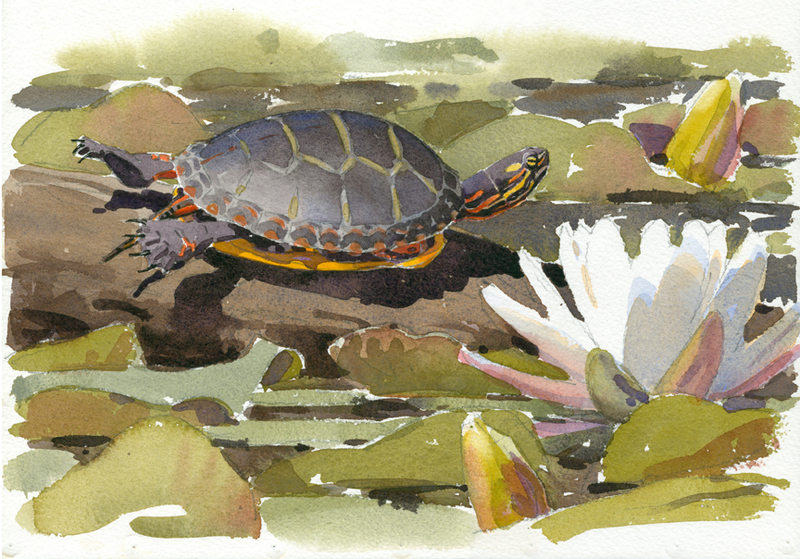 This entry was posted in Artists, Barry Van Dusen Residency, News and tagged A Guide to NE Dragonflies and Damselflies, Barry Van Dusen, Black-shouldered Spinylegs, Black-shouldered Spinylegs Dragonfly, Canada Geese, Dragonflies, Kingfisher Pond, Mass Audubon, Naturalist, Norfolk, Painted Turtle, Purple Martin, Snapping Turtle, Stony Brook Pond, Stony Brook Wildlife Sanctuary, Sweet Pepper Bush, Turtle Yoga, Watercolors, Wildlife Sanctuary on August 25, 2015 by Barry V..